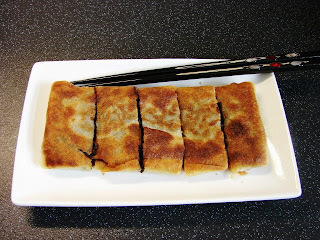 This stuffed bean paste pancake is typical of Shanghainese snack or dim sum. Very easy to make and nice to go with a cup of tea. Mix the pancake batter ingredients together. Grease a 30cm frying pan lightly with oil and make about 4 -5 pieces of 20 - 21 cm round thin pancakes/crepe. Only fry the pancake on one side, when the top is dry it is ready to take out. Leave the pancakes to cool slightly. Spread the flour paste around the edges, and fold the pancake to a rectangular parcel. In a frying pan, add about 6 - 8 tbsp of oil and fry the pancakes maybe 2 at a time till crispy and brown on both side. ** other than red bean paste, other typical fillings include lotus seed paste 蓮蓉 or chinese dates paste 棗泥. I didn't read your method carefully. After I make pancakes then fry in deep oil. Its very delicious taste. When I come to read your methold again,I realized that only add 6-8 tbsp of oil not deep fry.. AHHHH! I cooked wrongly..but delicious too..Anyway,I'll make this again and fry w 6-8 tbsps of oil. We like this recipe,thank you for sharing this.